Posted Sep 27, 2018 | filed under Weekly Banding Reports. Despite my hopes that this season could break the record for the busiest fall ever it is looking like we will only attain second place, which, really, is not too shabby at all. As I write this there is only a few more days to go and over the past week bird activity has slowed tremendously. 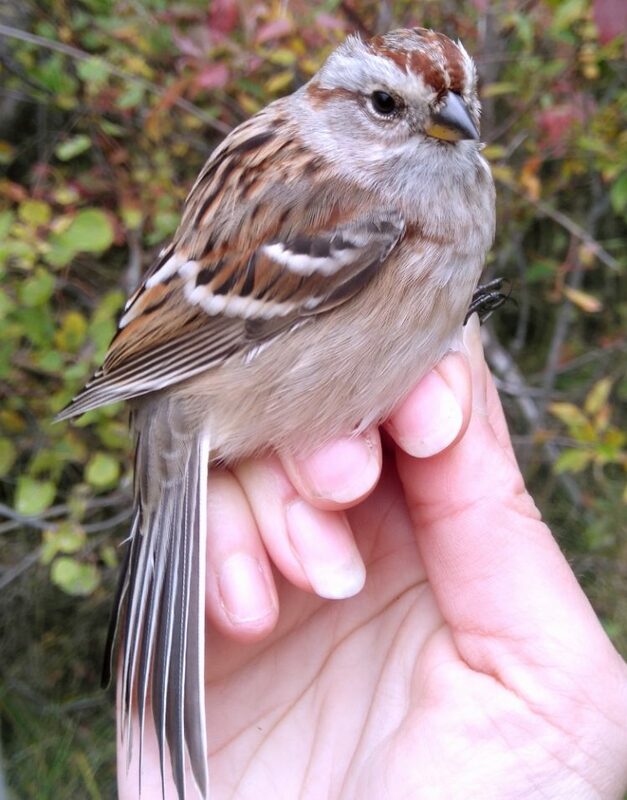 The surge of myrtle warblers is now just a trickle and slate-coloured junco, golden-crowned kinglet, white-crowned sparrow and American tree sparrow are the most common species being seen and banded. 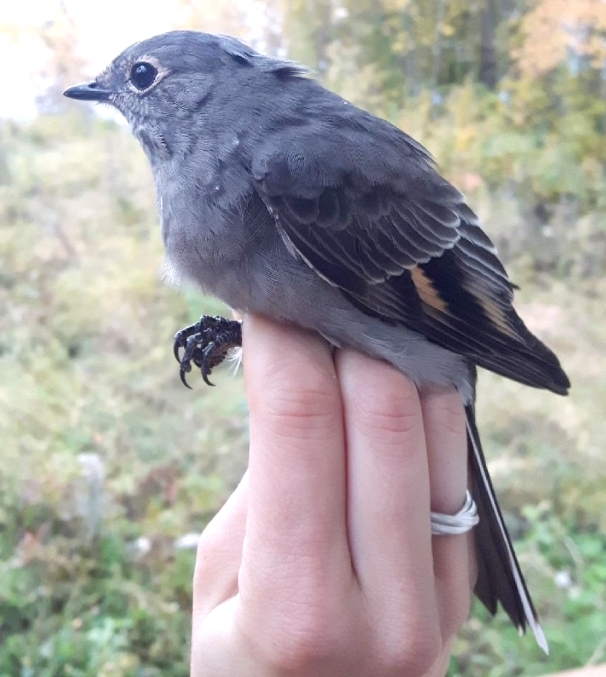 There have been some interesting sightings mixed in though, of species that we only see every few years, a varied thrush, Harris sparrow and Townsend’s solitaire. One of the solitaire even found its way into a net so it could be banded. Decreasing numbers of birds in the area was compounded by the fact that it has been quite windy over the past week and many of the morning were too cold to open first thing. Generally for songbird banding the temperature must be above freezing for us to open the nets. If it is below zero, there is a risk of the birds becoming too cold in the nets and as always bird safety is a huge concern for us. You may be thinking, ‘well the birds are out in the cold anyways, why would it be different in the nets?’ I would say that is a very good question and the answer is that the way feathers work they must be laying correctly. A bird’s feathers overlap each other and create a barrier that protects the bird from the elements. When a bird is in the net the strands of the net interrupt the feathers and create gaps in feather coverage where air can reach the bird’s skin. For a small bird that weighs between ten and fifteen grams even a few minutes exposed to the cold can be fatal. Although songbird banding is definitely slowing right down, owl banding has picked right up. 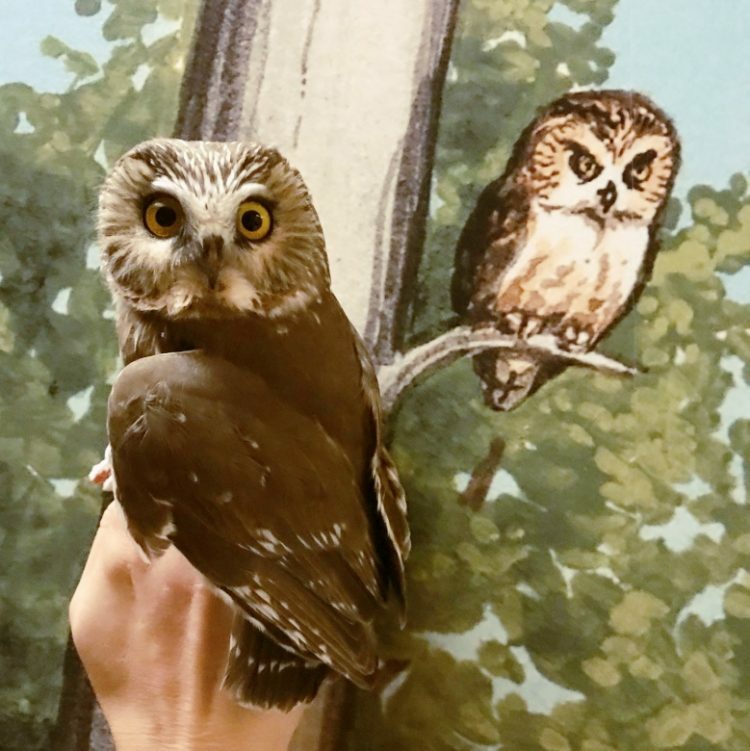 Last week we were sitting at around 20 owls and I was very worried we were on track to have the worst owl banding season on record. After several nights pulling in an average of ten owls, though, we are now at 80 banded which is putting us on track to an average or even above average year if the trend continues. Owl banding is certainly one of the most interesting experiences, and not necessarily because of the owls. There is something undeniably magical/daunting about working outdoors at night. The multitude of stars and brilliance of the northern lights takes my breath away even as every sound in the bush or set of glowing eyes makes me wonder ‘bear or bunny?’ I am sure it is almost always a snowshoe hare, but sometimes it is a deer or a flying squirrel. Once it was a group of eight coyotes. And once or twice it most certainly was a bear. Not that anything has bothered me any. They go about their nightly business as I go about mine.